The activities of powerful corporate lobbies on armaments, genetic modification and pharmaceutical issues in USA and UK are more frequently highlighted than those in the financial sector. Recently, however, leaks have propelled news of the ‘revolving door’ between the New York Fed and Wall St into the media. Former New York Fed president, Paul Volcker, went on to become the chairman of the central bank in Washington and Timothy Geithner was in charge during the last financial crisis before moving to the US Treasury. The Federal Reserve System, designed to avoid concentration of power, in practice – with Wall Street on the New York Fed’s doorstep – appears to lead decision-making. Geithner has been variously reported as saying that the Fed is ‘perceived as vulnerable to capture’ – or that the Fed is now vulnerable to capture. Its decision, made with Washington officials, to let Lehman Brothers fail and rescue AIG, was widely criticised and the lack of oversight in the run-up to the last crisis is acknowledged – an awareness also frequently expressed in Britain. A Senate Banking Subcommittee on Financial Institutions and Consumer Protection is to hold a hearing to investigate allegations that Fed supervisors are too cozy with the banks they oversee. 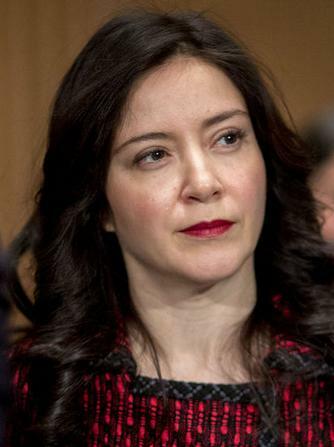 Fuelling the politicians’ anger were tapes from Carmen Segarra, a New York Fed examiner who pointed out weaknesses in the supervision of Goldman Sachs. 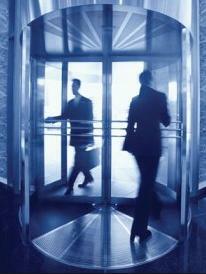 She had recorded her colleagues conducting a gentle cross-examination of Goldman over a questionable 2012 transaction. The next day, the New York Times revealed that an investment banker at the company had blown the whistle about another Fed official passing on confidential information to a junior banker at Goldman. The New York Fed was then obliged to report its own staff to the FBI and prosecutors. 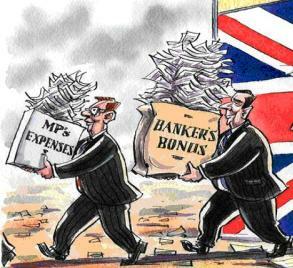 Over half Tory party income comes from bankers, hedge funds and private equity financiers. Peers who have made six-figure donations have been rewarded with government jobs. Read the Guardian article for detail about senior civil servants and ministers’ moves to corporates they had been regulating – or failing to regulate – such as Deloitte and Barclays. Milne singles out the cabinet secretary, Jeremy Heywood, as “the living embodiment of the revolving door, having moved effortlessly from the Treasury to Blair’s office to the investment bank Morgan Stanley and back to work for Cameron”. Milne sums up the shameful situation of politically broken Britain: “It defies rationality to believe that the prospect of far better paid jobs in the private sector doesn’t influence the decisions of ministers and officials – or isn’t used by corporations to shape policy. – but that leaves in place arms length inducements open to their families and friends . . .
Posted on December 6, 2014, in Banking, Civil servants, Conflict of interest, Corporate political nexus, Democracy undermined, Finance, Government, Lobbying, Parliamentary failure, Party funding, Planning, Revolving door, Vested interests, Whistleblowers and tagged Carmen Segarra, FBI, former lobbyist Cameron, Goldman Sachs, New Labour, New York Fed, Senate Banking Subcommittee, Seumas Milne, US Treasury. Bookmark the permalink. Leave a comment.